When you buy the standard Pro / Premium home user license (with a serial number registration, unlike the free version), you can install Malwarebytes Anti-Malware and Malwarebytes Anti-Exploit on up to three of your computers. If you haven't used up all three "seats", you can download and install Malwarebytes on a different PC. You don't need to take any further action - enjoy! If you've already installed Malwarebytes on three computers, however, you are left with two options: buy a new license, if you want to keep these three PCs or Macs protected. If you no longer need or want to protect those machines, start by reading this tutorial: "Uninstall Malwarebytes with serial number". 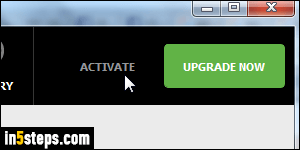 Once you are done, read "Download and install Malwarebytes", and come back to this tutorial. 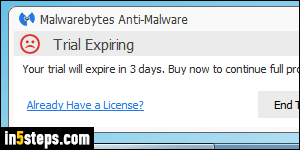 If you lost your license, you will need to contact Malwarebytes. 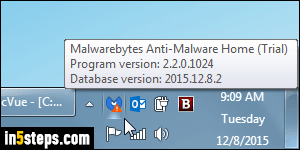 I now assume that you have installed Malwarebytes Anti-Exploit and/or the Anti-Malware product. They both have an icon in the notification area of the taskbar. You should make sure that the icon is always visible in the system tray, since it is used to inform you of any problem with the software or your PC. 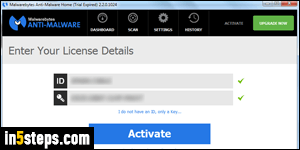 Once on the Enter your license details screen, click in the Enter your key text box, and type your serial number. If you have an Identifier from your previous installation, click I also have an ID and type it in the ID text field. Triple-check both for typos, and click on the blue Activate button. 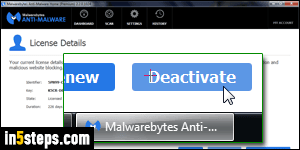 If everything was correct, you'll be back on the Malwarebytes Dashboard, now with a green smiley face that confirms that your program is fully registered! You can close the window.